One telephone call is all that is needed to make an appointment with one of our certified installers. The installer will then come to your home to evaluate the work to be done. Indeed, to evaluate a project adequately, you must not only know what structure you will be installing, but also how it will be used. That’s why our professionals do their best to understand your specific needs, and make sure to inspect the area where the structure will be installed. Once the installer has grasped the scope of your project and inspected the area where the structure will be built, he will be able to determine the number of piles needed and their placement to ensure the structure’s long term solidity. If necessary, he will also make sure that the piles are placed in such a way as to preserve the structure’s esthetics. Our installer will then be able to provide you with a detailed cost estimate. You can count on our expert installers to offer you the best solution for your project! Come installation day, forget about numerous subcontractors! Only your certified installer will show up to install the screw piles. The installer will use a Kubota mini-tractor that will spin the pile while exerting a vertical pressure onto it in order to drive it into the ground. 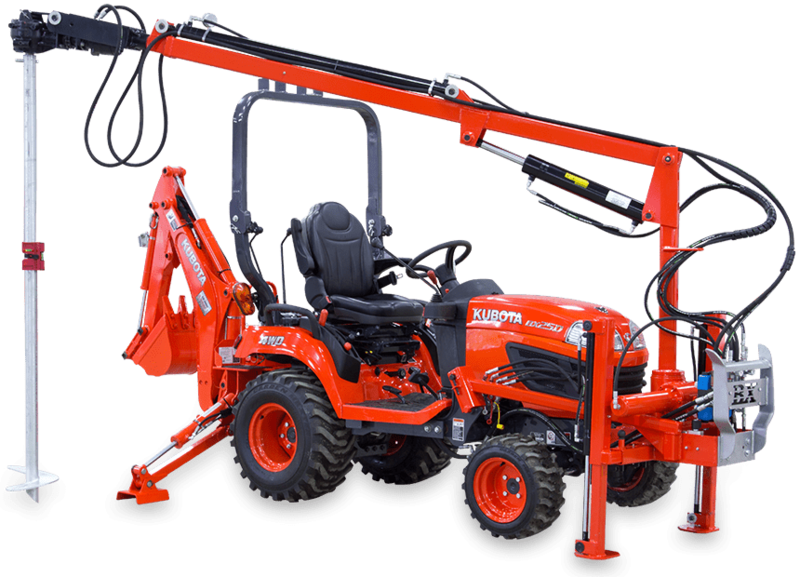 Rocks or other types of obstacles won’t hinder installation since the back of the Kubota tractor is equipped with a mini-excavator that will make quick work of it all! Once the installation is done, your property will be intact since our tractor is equipped with lawn tires that won’t damage your property. Mindful of your wellbeing, our installer will also make sure to put back everything into place before leaving the site. Forget about concrete curing times, your screw piles will be ready to support your structure as soon as they are installed! Often times, you can resume building work the same day the piles have been driven into the ground! Your screw pile foundations will be stable and level for years to come, guaranteed! Pro Post Foundations uses very efficient piece of equipment to install its screw piles: a Kubota mini-tractor. Agile on types of terrains, this mini-tractor is equipped with lawn tire to avoid damaging your property. Does your project involve an existing structure? No problem, our specialized equipment allows us to install piles underneath an existing structure, even in very tight spaces. The back of the Kubota tractor is equipped with a mini-excavator that can remove rocks and other obstacles to ensure the precise placement of our screw piles. It can even remove existing concrete piles (Sonotube®) and anchor the piles into rock ledges. Nothing will hinder installation of our piles, which means the work will be done quickly, many times in just one day! Contrary to screw piles sold in hardware stores, Pro Post Foundations piles are high quality engineered products certified by the CCMC (license # 13608-R) and meet Canada’s National Building Code requirements. Their installation must also be done by one of our certified Pro Post Foundations installers. Our screw piles are available for as little as $130 per pile, but many factors such as the type of structure and soil as well as the site’s accessibility and the scope of the work can impact on the final cost of your project. For a precise estimate, please contact one of your region’s certified Pro Post Foundations installers. Our expert will be able to determine the exact type and number of piles to install and to provide you with a cost estimate that includes installation.